Let’s give a warm welcome to our newest tutor of the month, Cheryl Hecksher! Cheryl is originally from Los Angeles but before moving to Las Vegas 12 years ago, she spent many years in Tulsa, Oklahoma and Mexico City. She is fluent in Spanish and loves Mexican food and music. Becoming a teacher was always one of her life’s ambitions, but she was not able to attend college until later in life. Immediately after obtaining her degree though, she moved to Las Vegas to pursue a teaching credential and a job. She is now in her 11th year of teaching. She has taught 2nd, 3rd, and 5th grades, as well as Adult ESL (English as a second language). “My favorite thing about teaching is working side-by-side with students who may be struggling and then seeing that moment when they finally ‘get it’,” Cheryl told us. She hopes to get better and better at teaching every year to help at-risk students close the achievement gap. To reach that goal, she plans on obtaining her National Board Certification within the next few years. She currently teaches 2nd grade and tutors 4th grade through Andson at Sunrise Acres Elementary School. She enjoys working with students of all ages. Cheryl has many hobbies including: travel, genealogy, and reading historical fiction. However, she is most passionate about art. She has even had the opportunity to travel to Florence, Italy about ten years ago. In Florence, she was able to see many of the Renaissance masterpieces, like Michelangelo’s David in person, which she had studied and written about in college. “It was an unforgettable experience,” she exclaimed. She plans on traveling throughout the world experiencing the art of many different cultures in the years to come. We are grateful that Cheryl is sharing some of her enthusiasm and passion with Andson and our students. Las Vegas native, Jessica Gentekos helps us greet April with her Tutor of the Month status, and has certainly been around the block when it comes to schools of Southern Nevada. She attended high school at Chaparral, her undergraduate at UNLV, and then taught at J. Marlan Walker Elementary before moving on to teaching second grade at Frias Elementary, where she still is today. When it comes to tutoring, helping students understand concepts they were taught at school, and witnessing the progress made really drives her. Her free time encompasses being a true Philadelphia Eagles fan and reading for pleasure. "It's kinda fun to do the impossible" is a great Walt Disney quote that lends itself to her life. Thanks Jessica, for aiding us in making things possible! March 2015 brings us tutor of the month honoree, John Yoder! John was inspired to teach simply by his love of working with kids, and to this day, that remains his favorite thing about teaching. Although he grew up in Elizabeth City, North Carolina, John has taken greatly to the southwest and teaches Education Computer Technology to all grades at Ronzone Elementary School here in Las Vegas. When not at Ronzone, John tutors through Andson at the James Boys and Girls Club. John’s favorite subjects are history and science, which would explain his adventurous passion for Mayan Archeology. In fact, John has visited 37 major Mayan archaeological sites and 18 national parks. His goal is to reach 70 total Mayan archeological sites and all 59 National parks in the United States. His 16 and 18 year old daughters must hear plenty of inspirational stories from all of that exploration! And as far as inspiration for his students goes, John states that “Your future is only as small as your imagination.” Thank you for bringing your bold spirit to Andson, John Yoder. The kids surely do appreciate it as much as we do. Gordon McCaw Elementary is one of Andson’s newest sites. Andson has agreed to maintain their funding so students can finish out the year in their after school programs. The school will soon to be transitioning into a magnet program. Not only will they be implementing our after school tutoring, but we will be assisting them in the process of finishing out their original curriculum before they begin the shift into new classroom material. This exciting new material will be centered on STEAM curriculum, which stands for science, technology, engineering, art, and mathematics. Andson will be at McCaw on Tuesdays and Thursdays from 2:30-4:00 p.m. with seven teachers and one support staff. These CCSD certified instructors will be helping grades 2-5 with homework and will provide small group tutoring. After this academic portion, students are provided a meal by Three Square, and then participate in a self-selected enrichment activity. During these times, the tutors will also be encouraging students to participate in setting goals for themselves to track their progress throughout the tutoring. Unique to McCaw Elementary is the School of Mines. Current principal, Jennifer Furman-Born took us on a short tour and proudly told us all about it. What started as a paper mache project in 1998 has turned into quite an attraction. Teacher Janet Bremer along with then principal, Janet Dobry shared this vision. Today, with the help of community partnerships, students all over the valley can experience a simulated mine and learn about Nevada mining and history. For more info on the McCaw School of Mines, please visit www.mccawschoolofmines.org. If you have to squint while reading this, we understand. Jessica Webb’s megawatt smile is quite blinding. In fact, Ellen Bordinhao can’t remember ever seeing Jessica without it. “Jessica has never missed a day's work. She is a very thoughtful and caring individual, and that is why she is our Tutor of the Month!” said Bordinhao, Andson’s Academic Developer and former Principal of Elaine Wynn Elementary School. It is Jessica’s calm demeanor that helps her teach severely emotionally challenged high school students at Cimarron High. She has worked for CCSD for 7 years as a substitute teacher and is now a Special Education teacher. Jessica received her Bachelors Degree from Michigan State University and her Masters in Special Education from Nova Southeastern University. With great tutors like Jessica Webb, we look forward to that too. We are thrilled to honor December’s Tutor of the Month, Teresa Weir. Teresa hails from northern Alabama. After graduating college, she accepted a teaching job in Florida, where she worked for 25 years. It was Teresa’s father who inspired her to become a teacher. He was a biochemistry professor at a university and she would accompany him to his classroom on weekends. Her imagination ran away with her as she played with his lab equipment, pretending she had an audience. To this day, science is Teresa’s favorite subject. Teresa is currently the Art Specialist at Sue Morrow Elementary School in Henderson. With hobbies in painting and ceramics and a love for science, what can’t Teresa do? We are happy to have you, Teresa. Thank you for your dedication! Andson has the best tutors. We really do. And no one epitomizes that more than Kim Sword. Kim comes from Cleveland, Ohio, although having a dad in the Air Force took her all over. “Growing up as a “military brat”, I was blessed with the opportunity to travel the world and experience so many things. As a result, I strive to bring a world of experiences to my young learners,” she says. Teaching is a second career for Kimberly, her first being in corporate management. Kimberly currently works part time for Mad Science and teaches at Roundy Elementary School. Having a passion for young learners, Kim says, “I want math and science to come alive. I want stories to leap off the pages. I want kids to be excited and challenged by every learning opportunity.” There is no doubt that Kimberly is accomplishing these goals. Just take a look at the photos included! Kimberly lives with her husband, two children, three dogs, two bunnies, and her many fish in Las Vegas. Kim, the kids are so lucky to have you, as are we! We would like to thank everyone who participated in our 3rd Annual Back 2 Class Bash! What a wonderful turnout, and we got so lucky with the weather! Thank you to our very generous partners for their donations. Without your help, Andson could never have given out over 500 backpacks, food and drinks. We are so grateful to be able to serve the youth of our community. While diving heavily into a rebrand of Andson we've changed a few things - loosing the "Foundation," developing new strategies to further our mission, and becoming more friendly for our client - kids and parents. Characters drive imagination and excitement for students through the learning process - we've never thought differently, but we haven't necessarily embraced a youthful element in our past branding efforts. What we've also realized is that students care very little that we are out there doing "educational," things. Instead, they care about the teachers and staff and the relationships they've formed with those adults. Education is an afterthought to them - which makes perfect sense for a young child. What we've coined is "Powerful Stuff." Anyone that goes through our programming will be a more powerful youth (and student, and child, even citizen) than those that do not. We're communicating Powerful Stuff through robots, monsters and characters we develop. We're also opening the doors for student-led artwork - which makes our creative team's life even easier. Overall, we're very happy with where this is going, and encourage non-profits and organizations serving youth to get doodling - who knows what you can come up with! It's always a dilemma - the work we do in Financial Literacy is great, why not take it national? Our answer is usually "No," followed by a statement on how you would lose the aspect of mentoring, the quality will be diminished, curriculum less effective etc. But what if we were approached by a group that was willing to recreate the culture of mentorship, and not attempt to use volunteers or one-time teachers for a lesson? We have had the amazing opportunity of licensing our curriculum to a passionate group of educators. The Comal Independent School District approached Andson to use the Andson Money Curriculum at the Fourth Grade Level for 18 schools. (Aside - how in the world would Andson be known in Texas, you ask? The introduction was made by way of friends at St. Jude's Ranch for Children - they operate campuses both in Boulder City, NV and San Antonio, Texas. Without The Ranch, we would have not been prompted to visit the Lone Star State). 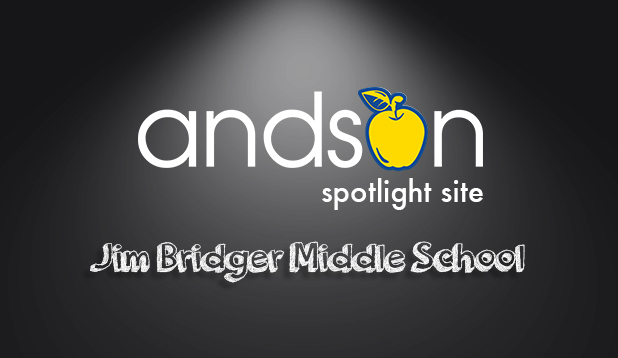 Andson co-branded and developed the materials, lessons and presentations to work for the demographic of Comal ISD - a district roughly the size of New Jersey. What we've realized however is that our goal of supporting Southern Nevada doesn't mean our products and services just stay in Southern Nevada. Look at this opportunity: First, there is a licensing cost - which means that Andson can have a stream of revenue that goes back to help us develop further products and services; Second, with the right partner, our commitment to mentorship and small, strong quality programs can continue. Comal goes above and beyond to pick the best instructors possible for our curriculum - we went down in early October to train 17 instructors. Some were long time substitutes that have been assigned to a particular school (and know that school's students well), some worked for the local Communities in Schools program, two were even school principals. Needless to say we were able to checkmark the criterion for passion. Thirdly, and most importantly is the feedback and development opportunity. We have just opened our curriculum up to a feedback loop including 1,250 new students - something that would take a massive staff on Andson's part to facilitate locally. Comal ISD and Andson will continue expanding till we are able to blanket the Elementary level, hopefully developing a feeder alignment and carry these students through their entire schooling with targeted lesson on Financial Literacy. Exposing our curriculum to new bodies of students means we can move exponentially faster to make our products and services even stronger - nearly impossible to match solely with local staff. Andson, for example, will monitor the Pre and Post Test assessments and will have access to feedback on Parental Engagement via homework assignments. These pieces will go back into Research and Development here locally, and then get rolled out to any licensees we may have in the future. This may be small win for other organizations that are built with revenues and licensing in mind. But for Andson, the idea that we can build a culture and climate in Financial Education from 2000 miles away, and retain some control, is an empowering concept. We are so excited to open up the doors for licensing and for our new counterparts in the Lone Star State. Thanks to our friends at St. Jude's Ranch for making the connections, and we hope that Andson will get as big as everything else in Texas! And of course, if interested in licensing, feel free to contact us via the website - we'd love to explore a new relationship. Children Ready to Head Back 2 Class! Andson and St. Rose Dominican Hospitals hosted the second annual Back 2 Class Bash on Saturday, August 3rd at the Goett Family Park in Southern Highlands. Families came out to enjoy an evening full of entertainment, free food, informational booths, and raffle prizes. Backpacks filled with schools supplies donated by the Las Vegas Hospitality Association and The Office Depot Foundation were handed out to approximately 600 children. "Having a summer event is a great way to get students excited about heading back to class" said Sonia Anderson, founder and CEO of the Andson Organization. "The heat didn't keep families and the community from participating, more than a 1000 people joined the festivities." Children played and bounced their way through Andson's Back 2 Class Bash that included fun carnival games and inflatables. Both kids and grown-ups had their pictures taken with Cosmo from Las Vegas 51's! The event also featured several community agencies such as Las Vegas-Clark County Library, Southern Nevada Health District, Clark County Fire Department, Las Vegas Metropolitan Police Department, Clark County School Police, as well as family-support organizations. This year's Back 2 Class Bash was made possible through the generous support of many organizations, businesses, and individuals that donated their time and resources. 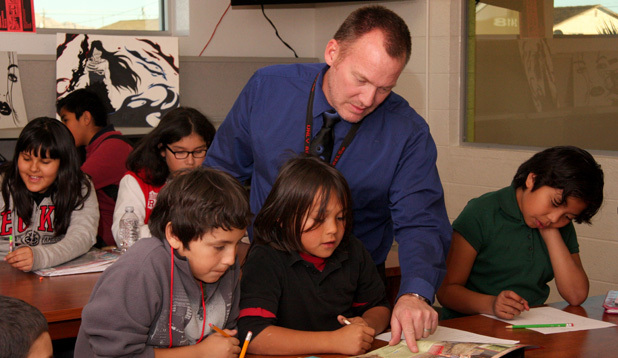 "Ensuring that our students are healthy and ready to return to school is a pleasure." said Rod Davis, President and CEO of St. Rose Dominican Hospitals. The event was also sponsored by American West Homes, M Resort Spa Casino, Nevada State Bank, and the Southern Highlands Community Association. Andson will be distributing the remaining backpacks and school supplies to other children across the Valley that benefit from Andson's outreach efforts and academic programs. Please join us in thanking all these amazing donors, friends, partners, and supporters who made Andson's Back 2 Class bigger and better. Are we the new Life Coach for kids? When we go out and promote Andson to a possible partner or client (aka parents and kids) we try to convey the dynamic of mentorship in all our activities. The reason we are so good at what we do is because there is no off-the-shelf program for our youth - we must connect with them in 2013 and meet them where they're at. That said, more and more parents (and adults in general) are extremely aware of the lack of life skills that our students and youth receive these days. It's enough to spark the conversation of where these skills can be best curated - home or school, parents or teachers. That's a different article entirely, however. What I am realizing more and more is that Andson, through providing academic support and performance programs, financial literacy programs etc., isn't just about facilitating curriculum - it's about motivation of young people through our passion. What we're building here for Southern Nevada is a whole lot more than any program. I'm starting to feel that we are life coaches for K-12. That is, we can inspire, motivate, reward and see how many of the 4,000 students we've impacted this past year succeed through the seeds we plant. Just look at what we're doing at the Back 2 Class Bash with Raising Canes and the TEAching stand. Yes, it's a beta program - this is the first run at it. We're not looking at this simply as an entrepreneurial lesson, however. Andson is teaching the concept of volunteerism and taking the money smarts you learn through business back to your own personal finances. This lesson is geared toward middle schoolers to learn through immersion. 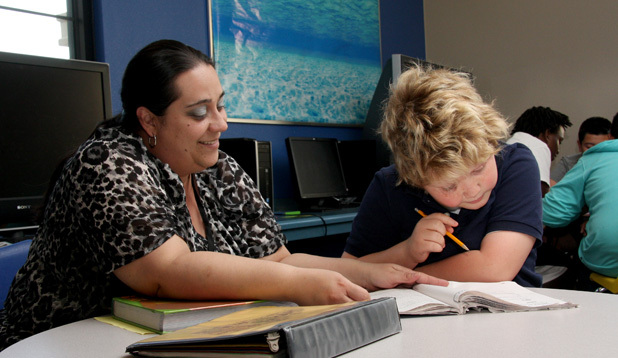 Whether it's receiving a letter that a high school student is now teaching their mother about banking, or having an elementary student run into one of our tutoring locations to show us their report card, our programs are creating an element of motivation in young people that really parodies what you see out of these adult life coaching programs. This is a service economy, and we certainly provide a service. Through our continuing passion, however, we are providing more than any single program ever can. Andson Academics has become our flagship service - a tutoring program that scales well, serves our communities, and creates partnerships and collective impact. The Academic Assistance model is constantly attended to - we take pride in the tweaks that make the program better and better. That said, Financial Literacy has really taken off as a core component of what we do here at Andson. This past year was absolutely pivotal in the way we view and develop our Financial Literacy curriculums. Nearly 2,000 unique students in 2012-2013 have already been directly reached by our Financial Literacy programming. What we learned from the Piggybank Project at Bracken Elementary was that it's not about just one workshop of programming - not a five to eight week period. Rather, Andson's role in 2013 is to carry a student through multiple iterations of curicula. We start at the Kindergarten grade level and work our way through 5th grade. It was an amazing program that will really prove its effectiveness as we see this year's 1st graders all the way through their elementary graduation. So, we started thinking, how can we accomplish the same at the High School level? How do we start with tiered curriculum, one that strengthens impact with every year until graduation? What we've developed is a new way of looking at our high school students' needs. This is no longer a few weeks of interaction - this is about implementation over 3+ years. At the Sophomore level, we explain the importance of grades, volunteerism in our community, and understanding needs vs. wants. At the Junior level, we begin to plant the seed of the importance of education on future earning potential, and how to creatively fund your college education. At the Senior level - we give them the full Andson curriculum, working with them for a greater understanding of personal finance. What we estimate is that nearly half of the students we start with, we get to work with in their Senior year. For the others (due to transiency rate, etc) they will have seeds planted that they would not have otherwise experienced. This model is a complete work in progress - we've written some grant requests and hope to start this with Communities in Schools in the 2013-14 school year at Chaparral High Sschool. Andson is committed to the idea of "Learn, Act, Learn" - no two schools or years should ever be exactly alike. Our materials have always, and will always cater to the student. This is how we personally can guarantee the greatest possible impact through our Financial Literacy workshops.